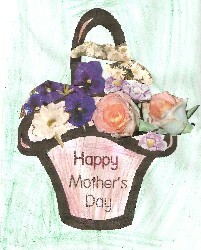 Make a mothers day basket flower picture using the free printable coloring page provided. Although many mothers would probably love to receive a beautiful bouquet of fresh cut flowers on mothers day, they do cost a lot and they don't last for long. This cute little craft is a more economical activity and will give mom a picture that will last! Use this collage craft to let your children create a basket of flowers like the one shown below, which was made by my daughter at age 3. The cutting and pasting that it requires are both activities that will help develop children's fine motor skills. 1. Let the children colour in the basket. 2. Glue the flowers around the brim of the basket. 3. Cut out the basket. 4. Use the ribbon to make a bow and glue (or staple) it onto the basket.